Due to the extension of our database we have to shut down PubMan for maintenance. Ready for the next version? Currently the MPDL staff is heavily working on a new Release of PubMan (Version 6.1). The implementation of new features and the fixing of bugs detected by our users is now finished and we can go into the QA phase. In this phase the PubMan solution will be heavily tested and further bugs will be fixed. Therefore we approached the final phase of the release cycle and you can experience the outcome of our efforts soon. We will keep you up to date on the current PubMan activities in the MPDL! PubMan is now included in the CARPET catalogue of electronic publishing software tools and services. 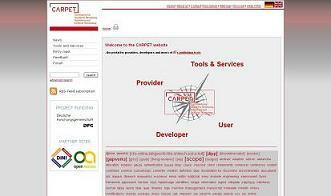 To support the efficient use of electronic tools and services for scientific publishing, the CARPET Project is building an information platform including a catalogue, as well as an ePublishing community, to bring together developers, providers and users of ePublishing tools and services. So, if this awoke your interest, feel free to visit the PubMan entry on CARPET, browse the catalogue for further useful tools or services, or even join the CARPET community! Quality of metadata – who cares? Quality checks on metadata submissions – are they Conditio-sine-qua-non for providing open access to publications? Or are they best offered as a service in the background – even after OA publication? … did you know that the PubMan you know (http://pubman.mpdl.mpg.de/) is not the only one of its kind? … and manpower for further development. Additionally we get more and more feedback on our mailing lists from people who are currently installing PubMan for evaluation.